I’ve written in this space before about Jewish-Catholic issues and in particular the Jewish community’s awkward relationship with Pope Benedict XVI. Whether he’s in DC, Israel or Vatican City, this Pope has made us squirm in our seats whether with his own personal history as a reluctant member of the Hitler youth, his sins of omission at Yad Vashem, his repeal of the excommunication of a prominent Holocaust denier and now the latest flare-up, his beatification of World War II-era Pope Pius XII. The controversy stems from the ongoing and unresolved debate over the extent of Pope Pius’ possible actions and lack thereof to save Jews during World War II. Some say he made a political decision not to extend the Vatican’s protection to Rome’s Jewish community which resulted in the deportation of over 1,000 Jews to Auschwitz. Others, including the current Pope claim that Pius worked silently and secretly to save Jews and that the proof of this resides in the as-of-yet unreleased archives of Pius’ papacy. The issue has flared up at every step in Pius’ march toward sainthood. Over the weekend came the announcement that Pope Benedict was moving both the beloved Pope John Paul II and the historically dubious Pius XII through the beatification process towards official sainthood — they both now need a miracle ascribed to them to complete the process. The pairing of the Jew-rescuing John Paul with the more ambiguous Pius seemed to many to be salt on the wound of the Catholic Church’s continuing reluctance to openly and honestly confront its legacy in relation to the Shoah. Others bemoaned that all the progress that had been made in Jewish-Catholic relations during the papacy of John Paul II was being undone by Benedict XVI. Even without the announcement coming in the same news cycle as the theft of the “Arbeit Macht Frei” sign from Auschwitz and the accompanying over-wrought reactions, the Vatican seemed once-again surprised by the Jewish community’s outrage at Pope Benedict’s decision. So unsettled was the Vatican that they released a statement today clarifying that the beatification of Pius XII was not an “act of hostility” against the Jewish community or those who criticize Pius’ historical role. And I believe them when they say that. The problem is we’re judging Pius from two different sets of criteria. The Vatican statement emphasizes that Pius is being evaluated on his “Chrisitan life” rather than the “historical significance of his choices.” By that they mean, “his intense relationship with God and continuous search for evangelical perfection.” I have an incomplete understanding of that last phrase, but one definition I found explained, “evangelical perfection… is nothing but inward sincerity, and uprightness of heart toward God, although there may be many imperfections and defects intermingled.” In other words, one can become a saint on the basis of their faith and devotion even if their actions were less than saintly. I also get the unstated implication that there would be something unseemly in the Vatican denying any Pope eventual sainthood. While the actions of any particular Pope may have been fallible, their election as Pope in and of itself signifies “evangelical perfection” worthy of sainthood. This is a very difficult concept for me to wrap my head around as a Jew — actions and devotion are inextricably intertwined. At the same time, one can only expect Catholics to choose their saints based on the criteria of their own determining. Which points to the limits of interfaith dialogue. There are certain things we are never going to agree on — and the Vatican has reminded us of that, yet again. Last week Pope Benedict XVI completed an eventful trip to Israel, the Palestinian territories and Jordan — the reviews, one could charitably say, were mixed to negative. One thing that is clear, if it weren’t already, that the current Pope does not enjoy either the personal charisma nor the magic touch with the press of his predecessor. From pleading ignorance a few months ago after un-excommunicating a rebel Bishop who denies the Holocaust, to the Pope’s own spokesman in Jerusalem incorrectly asserting that the Pontiff was never a member of the Hitler Youth (he was), Benedict constantly seems to be getting in his own way. Add to that, the harsh reactions of the Israeli public to the Pope’s statement at Yad Vashem, his endorsement of a Palestinian state and criticism of the security wall and you have the ingredients for what could have been an awkward evening at the Nunciature of the Holy See last Wednesday as part of the Washington DCJCC’s Insider Embassy series. While the Pope was still in the Holy Land, a group of us walked past the permanent protester on Massachusetts Avenue and into the Vatican’s official diplomatic mission to the United States. Amidst portraits of bishops, popes and saints we were received warmly by Archbishop Pietro Sambi, the Apostolic Nuncio (Ambassador) to the United States. After we were given a tour of the Nunciature’s gorgeous mansion (circa 1938) we settled down for a conversation. The Nuncio has more than a passing acquaintance with Papal visits to Israel — prior to his posting in the US he was the Nuncio in Jerusalem and oversaw many of the details of Pope John Paul II’s visit in 2000. In all, he has spent over a dozen years living in Jerusalem and so came to our dialogue with a keen appreciation of the difficulties and fraught sensibilities that accompany a Jewish/Catholic dialogue. He was also quick to acknowledge that John Paul, the former Karol Wojtyła, had a special relationship with Jews going back to his boyhood Wadowice in Poland where Jews were among his playmates and friends. He was involved in rescuing and hiding Jews during the war. In short, John Paul II would have been a hard act to follow, even if the current Pope weren’t a former (if extremely reluctant) member of the Hitler Youth and soldier in the Wermacht (who to his credit, deserted). Archbishop Sambi discussed in-detail many areas of concern in the Jewish-Catholic dialogue, beginning with the sea change of the Second Vatican Council which revised Catholic positions on the Jewish convenant with God, absovled Jews of any collective responsibility for the crucifixion of Jesus, and a firm rejection of any church teachings that purport to support anti-Semitism. He acknowledged that those revisions were only the starting point in Jewish-Catholic dialogue and that declaring that the church does not support anti-Semitism is not that same as actually purging it from the Church — even 40 years later. Much of the evening was given over to Archbishop Sambi’s tales from his days in Jerusalem. He is a strong believer that there ought to be some sort of document to lays out of the common beliefs of Catholics and Jews. The problem of course, is that while the Church has clear lines of command, the Jewish situation is much less hierarchical. So in Israel the problem becomes, if you’re to do interfaith dialogue, who do you dialogue with? Do you begin with the Chief Rabbis (who have a reputation for being government functionaries) or popular rabbis (which risks insulting the Chief Rabbis)? In Archbishop Sambi’s case, he asked the Chief Rabbis to recommend rabbis from the major cities. The Nuncio was asked if there were any attempts at a Jewish-Catholic-Muslim trialogue. He responded that while there were attempts, the only success was during the Gay Pride Parade in Jerusalem during which time the Jewish, Christian and Muslim clergy united in their opposition to the march. The Archbishop’s statement from the time was that, “Jerusalem is not a city for pride, but for submission to the Lord.” He is aware that much of the opposition to the march descended into vitriol and inspired acts of violence against the marchers. For my part, as moderator, I felt compelled to recommend the documentary film Jerusalem is Proud to Present which tells the story of the march from the perspective of the activists organizing and some of the most extreme who opposed to it (we presented the film as part of the Washington Jewish Film Festival in 2007). One other comment of note, was that the Nuncio said that while he was in Jerusalem he was on more than one occasion asked if the Vatican were hiding artifacts taken from the Holy Temple during the Roman sack of Jerusalem in 70 C.E. 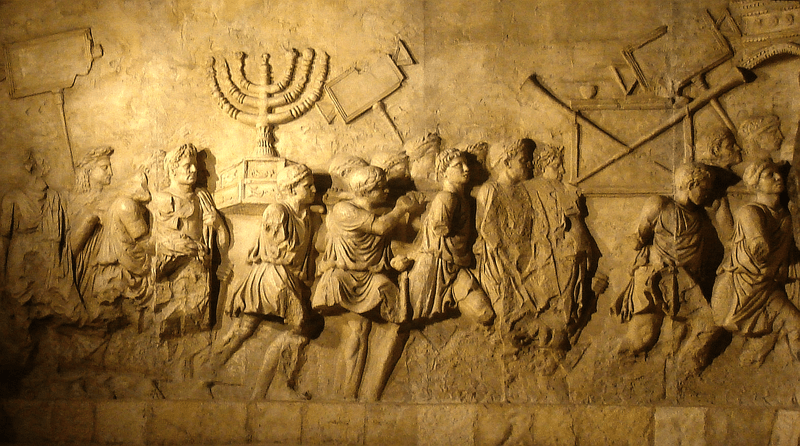 He assured us that these artifacts were not being hidden in the Vatican basement, and pointed out that at the time of the sack of Jerusalem, Christians were also persecuted by the Romans — making it highly unlikely that they would hand over their war loot to them. For what it is worth, Wikipedia bears the Archbishop out on this point. "Not in our basement" says the Vatican. The evening served as a reminder that while the personality and personal history of current Pope may highlight some of the tensions that still remain between Catholics and Jews, the relationship has come a long way. The opportunity to connect with a highly placed official in the Vatican was a truly remarkable experience. More than that, everyone there that evening, whether they agreed with the Archbishop or not, was impressed by their generous hospitality and their genuine sincerity in talking with our group. A major kerfuffle in Catholic-Jewish relations sprung up last week when Pope Benedict XVI un-excommunicated a couple of self-appointed Bishops who reject Vatican II and accept Mel Gibson. The Pope was apparently the last person to learn that one of these Bishops, Richard Williamson, in addition to prefering the Latin Mass, also prefers to perpetuate the pernicious lie that six million Jews did not die in the Holocaust and that the paltry 200,000-300,000 who did die did not do so in gas chambers. The Pope apparently isn’t very tuned-in to Swedish television. In all fairness, I can’t say that it’s on my TiVO either. In order to be admitted to episcopal functions in the Church, Bishop Williamson should also publicly and unequivocally distance himself from such positions about the Shoa, which were unknown by the Holy Father at the time of the lifting of the excommunication. This statement seems to have satisfied much of the organized Jewish world. But, parsing this statement reveals that the Pope is not threatening the revocation of the revocation of excommunication, rather the withholding of admission to “episcopal functions in the Church.” Roughly translated, Bishop Williamson can be a Holocaust denier and remain a Catholic, but he can’t remain a Holocaust denier and be a Bishop. They’ve already been accepted back into the Church as members who can receive the sacraments and avoid the after-life penalties that would result from a serious lack of salvation. What remains at stake is whether they will be allowed a role in administering these sacraments. And perhaps that’s as it should be. While Holocaust denial is a vile lie and Holocaust deniers base anti-Semites, acknowledging the historical fact of the Shoah is not a tenet of the Catholic faith. Pope Benedict may decide that Williamson can’t work as a priest, but as long as he accepts the teachings of Vatican II, (or at least does not publicly crusade against them) what he believes or doesn’t believe about the Holocaust is moot. Whether that will satisfy those in the Jewish community who have felt wounded by the Vatican’s mishandling of this matter remains to be seen. One thing is certain, Richard Williamson is not the first Catholic holocaust denier, and probably not the last either. 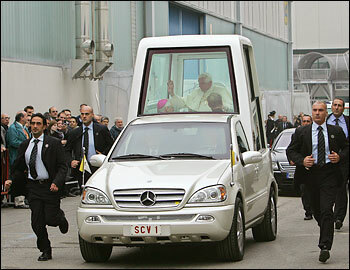 So in case you haven’t heard about it, the Pope is coming to DC this week. The relationship of the Jewish community to the Holy Father, even in the best of times, is how shall we put it, fraught with mixed emotions. And like so much else with Benedict, the prior Pope casts a long shadow, mostly because he moved Catholic–Jewish relations forward tremendously; but also because the young Karol Józef Wojtyła was personally responsible for the rescue of Jews in Krakow during World War II. Young Joseph Ratzinger, though from an anti-Nazi family, was a reluctant member of the Nazi youth, and while his passive resistance to enabling the Nazi regime and ultimate desertion of his military post were certainly brave and noble, they lack the drama of his predecessor’s narrative. And to his credit, this pope has done and said all the right things to demonstrate his goodwill towards the Jewish people. But just as he personally embodies contradictions, he also must also contend with the contradictions with which any world religion must encounter the rest of the world. However, the certitude of the Catholic faith is freighted with a weight of history that makes its declarations of being the “one true faith” seem more menacing than when Jews recite as part of our liturgy, “unto you every knee must bend, every tongue vow loyalty.” And the history of Jews and Catholics is so intertwined, that even a a relatively benign decision such as a Papal decree making it easier to celebrate the Tridentine Mass engenders controversy because of its calls to convert Jews in its Good Friday liturgy. No one reasonably expects that these masses will engender mass violence against Jews as they have in past times, but to not oppose them on principle also feels like a betrayal of those predecessors who were the victims of such violence. But putting all that aside for the moment, welcome to Washington, Pope Benedict. We hope you like our new stadium, and that the traffic is a little easier for you than for the rest of us. We’re sorry if that whole bobble head thing didn’t quite work out they way we hoped it would–trust us, it was meant as a sign of affection.